My brother is 15 years younger than me and a fantastic guitarist. 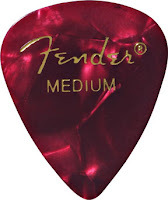 He’s been a fantastic guitarist ever since he picked up a six-string at the age of 13. I remember teaching him a couple of chords early on. Six weeks later he was trying to get me to understand the concept of using a capo and how I could drop the tuning on a string to bring in more depth to a chord. Needless to say, as the proud older brother, I developed all kinds of excuses which kept me busy enough that I wouldn’t have to sit down with my little bro and be humbled by his understanding and execution of music. Everyone touted his “gift” and how easily he was able to learn things on that guitar. And, yes, he certainly did exhibit an enormous amount of talent early on, but what no one gave him credit for was that he worked tirelessly developing each and every technique. Day after day J-man would come home from school, dump his books on the couch, and go to his room to get his hands on that fret board. Long evenings led to long nights of tirelessly repeating sequences, runs, and riffs. There was always the emergence from the room for food and bathroom breaks, but right back into that room he would go. There were times of frustration, times of epiphany, and times of sorrow that he experienced trying to learn to master that instrument. 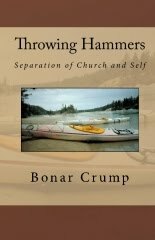 Tulsa, OK, August 25, 2010 – New author, Bonar Crump is finding his book THROWING HAMMERS: SEPARATION OF CHURCH AND SELF is creating quite a stir. Ranked #9 on Amazon.com’s Hot New Releases list in June, Crump’s book covers a controversial topic that is making headline news everywhere. World-renowned author and researcher, George Barna, is asking about THE CRISIS OF CONFIDENCE IN THE CHURCH and major news outlets are interviewing prominent author, Anne Rice, about her recent declaration to, “Quit Christianity in the Name of Christ”. “Those of us that have been paying attention the last 10 years have noticed significant rumblings in the distance concerning Christianity, relevance of the Christian church, and the overwhelming sense that change is coming. The recent denouncements of Christian religion in favor of a direct relationship with Christ by authors like Anne Rice and Carol Harper signal that the birth pains of this provocative message are at hand,” Crump said. Crump has been receiving support across the nation. 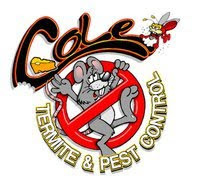 One Atlanta-based motivational speaker, Joann Corley, posted a quote from the book on her Twitter page, “We challenge the ‘big dog’ or we accept the leash.” Bonar Crump. challenges you to think outside the box, doesn't mind if he offends you, all-the-while making for an entertaining, thought provoking read. Would love to see more books like this! 5 stars from me. Get ready for a whole new perspective on church, faith and religion. From the first page of the book, the author challenges you to cast off old ideas and open yourself to new possibilities for your faith. I am a Christian who tired of a church experience that left me feeling flat and unfulfilled. Reading this book helped me to realize that I am not alone! There are others out there searching for a way to live out their faith outside of the trappings of a one-size-fits-all religious institution. There are others out there longing to explore the unique gifts that God gave them and to use these gifts to live out their faith in a vibrant and meaningful way. If you are among these searchers, pick up this book and brace yourself for a whole new perspective. This is an exceptional book that helps people truly discover the true meaning of what is going on inside the Church. An enlightening and open suggestion that causes the reader to truly look inside their beliefs of their faith and explore what people believe they should interpret the Church to be. This book opens the eyes of what has be questioned for so many years, but has never been brought to the forefront. A must read! I liked the book - but it's not for everyone (as the author has acknowledged). It will either get your head nodding in agreement or piss you off - there's not alot of wiggle room for anything in-between. Crump has no hesitation in calling a spade a spade, and he makes no apologies for it. "We challenge the 'big dog' or we accept the leash." Crump's message is like a spiritual AED (Automated External Defibrillator). An AED can diagnose a number of potentially life-threatening cardiac problems and treat them with an appropriate amount of electrical therapy. Like an AED, this book can apply its own "shock" to your spiritual heartbeat. The delivery may offend some, but the message is straight-forward with little wiggle room. The author doesn't apologize for his display of intestinal fortitude in such a flammable topic. You will either love it or you will hate it. With numerous, to-the-core topics of internal struggles, this is definitely a book you will read through more than once. I really never had any idea who I was until after I left Lubbock, TX. I was working full-time for an exterminator in Frederick, OK, for three years when it dawned on me—”I can’t stay in a rural town of 4,000 working with poison for the rest of my life.” God’s voice spoke to my heart very clearly one day sitting on the swings at the park near my house. I became acutely aware of the fact that what I did from that point (20 years old) until I was 25 was going to shape the entire direction of the rest of my life. This is where the journey begins—on a swing. I enrolled in Cameron University (Lawton, OK) the following week, transferred to Oklahoma Baptist University after finishing my freshman year, met my wife, graduated with a Bachelors in English in ’94, was married in ’95, moved to Dallas for five years, North to Tulsa in ’99 and we had our daughter in ’05. The English/History degree was something I fell into based on interests more so than a drive toward a specific goal. I intended to go on to Law School at OU, but I never developed the interest for law that I knew would be important to my success. I still struggle with investing in things I’m not interested in or passionate about—I mean, come on, what’s the fun in that!